Rational people of the world, let's be rational together. This month's SI Kids' cover was a harmless rendering of Miami's Big Three as the Three Musketeers, not a malicious stab at the Cleveland Cavaliers and their preteen fan base. Do we have to get into this? Apparently we do. Today, a lot of media outlets turned on the pressure for Cleveland fans to get pissed off because an artist's rendering of LeBron James alongside Dwyane Wade and Chris Bosh as the Three Musketeers, with the title "All For One: And Wins For All?" is on the cover of a sports magazine for kids. Now everyone thinks they're dressed up as Cavaliers, because their shirts are "wine-and-gold," and that this here is the SI Kids staff's chosen method for publicly dissing Cleveland. 19 Action News' Jen Picciano infiltrated a local Borders to interview an elementary school student who said, with all the vehement emotion of a ten year-old boy, "This makes me mad." Me too, Yuval. Yes. Because Cavaliers fans' public outrage and humiliation definitely needs a new target, and that target definitely needs to be a magazine known for athlete drawing contests, mailed-in baseball card captions like "Who tooted? ", and a cartoon mascot named Buzz Beamer. The Miami New-Times wants us all to admit that Sports Illustrated Kids' decision was "kind of stupid." No. Looking for subtlety in what is directed at prepubescent Justin Bieber fans is kind of stupid. Eliminating all potential historical references at play except for the one that best upsets and excites a bitter, excitable fan base, is kind of stupid. Deciding that "all for one" can only be a copyright breach and not a historical reference that has nothing to do with basketball, but a lot to do with kids' childhood playground games, is kind of stupid. How many of us were once a member of a Musketeers trio during recess? On WFNY, there is already a detailed study on whether the Cavs have a legal case against SI Kids for using the "all for one" slogan, which is the team's registered trademark and has been printed on their publications and billboards. WFNY suggests that the Cavs wouldn't have much of a case, because hypothetically SI Kids could get away with it by saying the cover was intended as parody. Parody. From a sports magazine for kids. I interned for SI Kids in summer 2009. The first blog post I wrote suggested that if Roger Federer was really the G.O.A.T. of men's tennis, then he should rest up, because "a lot of the goats I've seen look like they have swollen knees." In another I went so far as to say that Real Madrid was "the New York Yankees of Europe." This is what counts as taking shots at athletes or at teams in a kids' sports magazine. It is not subtle or intentionally inflammatory. It is for young sports fans and their reading skills. 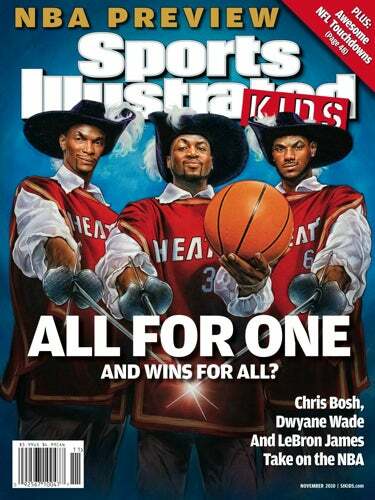 The cover story in question is about notable trios in sports history, because there are three superstar players on the Miami Heat now, and because the Three Musketeers is a reference kids can relate to, and because all of those components make for a nice painted magazine cover with nice gold trim. Relax, everybody. It's for the kids.